“A cigarette that bears a lipstick’s traces,” she begins, threading a single note almost through the entire phrase, her cadence buoyant but relaxed. This of course is Billie Holiday, easing into categorical reverie on “These Foolish Things (Remind Me of You),” on a 1936 recording with pianist Teddy Wilson and his band. You’ll find it on Billie Holiday: The Centennial Collection (Legacy), a single-disc compilation released this spring-part of a timely onslaught of reissues, remembrances, salutes and séances put together to mark the great singer’s centenary. Please excuse me if I sound a little dazed and nonplussed by it all. I take a backseat to almost no one when it comes to ardent enthusiasm for Lady Day, but the recent tide of tributes has struck me as a little forced, and largely hollow. One week this April, around the singer’s birthdate, I counted more than half a dozen related bookings in New York, featuring heirs as prominent as Andy Bey, Cassandra Wilson, Brianna Thomas and Cécile McLorin Salvant. Along with Wilson’s Coming Forth by Day (Legacy), any tally of recent jazz-vocal releases would have to include José James’ Yesterday I Had the Blues: The Music of Billie Holiday (Blue Note)-another admirable, tasteful, mostly forgettable attempt to rebottle the old magic. The problem as I see it is a matter of elucidation: For all this commemorative hullabaloo, it’s unlikely that we’ll emerge with a clearer picture of Holiday and her art. Over the course of her career, from the mid-1930s to the late-’50s, she projected wilting heartache, bluesy resilience and scathing political will, always with a casual mastery of content and form. She was a fount of swinging ebullience and a doyenne of dirges: Our Lady of Sorrows. She was vulnerable and flinty, a tragic case with little use for your pity. “All those who have attempted to write about her have discovered that there are many Billie Holidays,” John Szwed writes in the introduction to his slim but illuminating book Billie Holiday: The Musician and the Myth (Viking), the most rewarding bit of Billieana to surface in any form this year. On that point, Szwed, author of previous biographies of Miles Davis, Alan Lomax and Sun Ra, isn’t just sizing up the task at hand. Holiday has loomed as an irresistible, inscrutable challenge to so many over the years that the difficulty itself has become a central part of her lore. 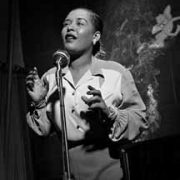 Robert O’Meally, who preceded Szwed as director of the Center for Jazz Studies at Columbia University, set a standard with Lady Day: The Many Faces of Billie Holiday (Da Capo), published in 1991. Another insightful scholar, Farah Jasmine Griffith, expanded on that many-sidedness a decade later with In Search of Billie Holiday: If You Can’t Be Free, Be a Mystery (Ballantine). Both books are important to the interdisciplinary field of academic jazz studies, taking into account not only the surviving evidence of Holiday’s life and music but also the measure of her image in its myriad iterations, from the literary to the photographic to the mythic. As its title suggests, Billie Holiday: The Musician and the Myth attempts to separate the Holiday legacy into at least two component parts. Among Szwed’s new conclusions is a reconsideration of Holiday’s sensational 1956 autobiography, Lady Sings the Blues, and especially its credited ghostwriter, William Dufty. Evaluating the book as a bid for sympathy, Szwed sifts through the considerable material that was removed at the request of her publisher and their lawyers. Much of that material involves celebrities in Holiday’s orbit, including the actress and socialite Tallulah Bankhead and the film visionary Orson Welles. (Both were white, and both, it’s clear, had relationships with Holiday that crossed over the line of mutual appreciation.) More than an accounting of scandals averted, this piecing-together of social fabrics is a glimpse of Holiday’s artistic reach-and the sophisticated circles in which she traveled, with apparent comfort but not without complications. Still, it’s unclear how anyone could accurately parse the life from the art, which may be one reason for Holiday’s enduring appeal. It’s certainly a reason why Holiday, of all the great singers in our pantheon, has been the most often emulated. Well before these centennial rumblings began, there were impersonations aplenty, by Dee Dee Bridgewater, Madeleine Peyroux, Vanessa Rubin and others, notably the drag performer Joey Arias. Last year I saw Audra McDonald in a Broadway revival of Lady Day at Emerson’s Bar & Grill, a revue whose sloppy book and strained premise didn’t prevent her from winning her sixth Tony Award. So maybe it’s just a species of fatigue, a numbness born of exposure, that triggers this wariness for me as a listener. Or maybe it’s that so many of these singers fixate on the signature intangibles of Holiday’s style. It’s obviously my own problem that I hear too much Holiday in McDonald’s evocation and not quite enough in Wilson’s. In any case, I’m heartened by the idea that these developments draw people back to Holiday’s musical corpus-and resigned to the fact that these foolish things, with their attendant reminders, will keep on coming. Maybe you heard, but this December will bring the centenary of one Frank Sinatra.